I peeled the package open with anticipation. I clutched the contents in my hands, grazing them with my fingertips for a closer inspection. As a Vault member of Third Man Records, it’s always a surprise; and this shipment was to be a special rendition of Jack White’s second solo effort, Lazaretto. I removed the blue and white record from the sleeve and placed it on the turntable. Then the needle fell. Lying on my couch, blood curdling cacophony repeatedly invaded my vibe. I ripped the record from the player and examined it. I set it back down, and the sound relentlessly stabbed my ears. Did the record warp en route? Had my turntable taken it’s final spin? I’ve never stared at a record so much in my life. I finally let it be and played something else to ensure the player kept on playing. It wasn’t until later that I uncovered the trick: it plays from the inside out. Luckily I found this out before setting foot in the record release show a couple of days later at the Fonda Theater, where I had entertained the thought to take the record and throw it on stage in frustration like a dangerous frisbee. 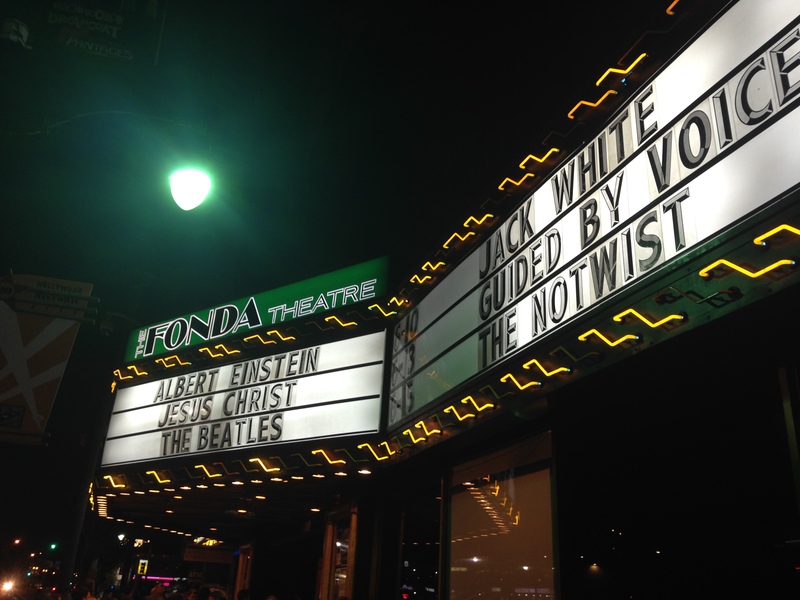 As I rounded the corner onto Hollywood Boulevard, I looked up at the marquee. Albert Einstein. Jesus Christ. The Beatles. Jack White. I walked inside with a smirk. The place was packed. I’ve mulled over the thought that Jack White is the sole rock & roll star of this era in both a positive and negative light for over 10 years now. I had a hard time with The White Stripes; it wasn’t until The Raconteurs came around that my ears perked. Then it was The Dead Weather that shot me over the moon. And then hearing “Love Interruption” cemented it for me. While I still may raise an eyebrow at certain aspects of his playing or persona, the material, the eccentricity, and the effort have my constant attention. If the record and the marquee weren’t enough signs of Jack White’s attention to detail, I was reminded again as the crew set the stage. Dressed in uniforms that included suspenders and hats, sheets covering an array of instruments were removed in style. I was also reminded of the fact that Jack White is a mainstream act, as indicated by the growing crowd around me. It hurts to admit that we live in a terrible time for rock & roll; all of the effort, swagger, reference points, and vibe that would soon take place on that stage are not reflected in the crowd. Perhaps this is part of why I gravitated towards metal: I can go to a show and feel that sense of community, to be part of the tribe. I don’t know you, but you look like me, we have similar sensibilities. Tonight, I could not feel that. People were not dressed to impress, they looked like people who the White Stripes were once a footnote in their iPods rather than having adopted the rock & roll religion. All of that said: they knew the songs and they were into the show, so what do I know. At least they were not the dreaded ‘industry crowd’ that is loathe to the LA music scene, especially at shows of this caliber. As the room darkened and the band sans their leader began to come out to their posts, I noticed the unfamiliar feeling of being hot and humid. Were there humidifiers in the room to add to the ambiance? Maybe. It’s not a rock show unless you’re whipped up into a frenzy and sweating. 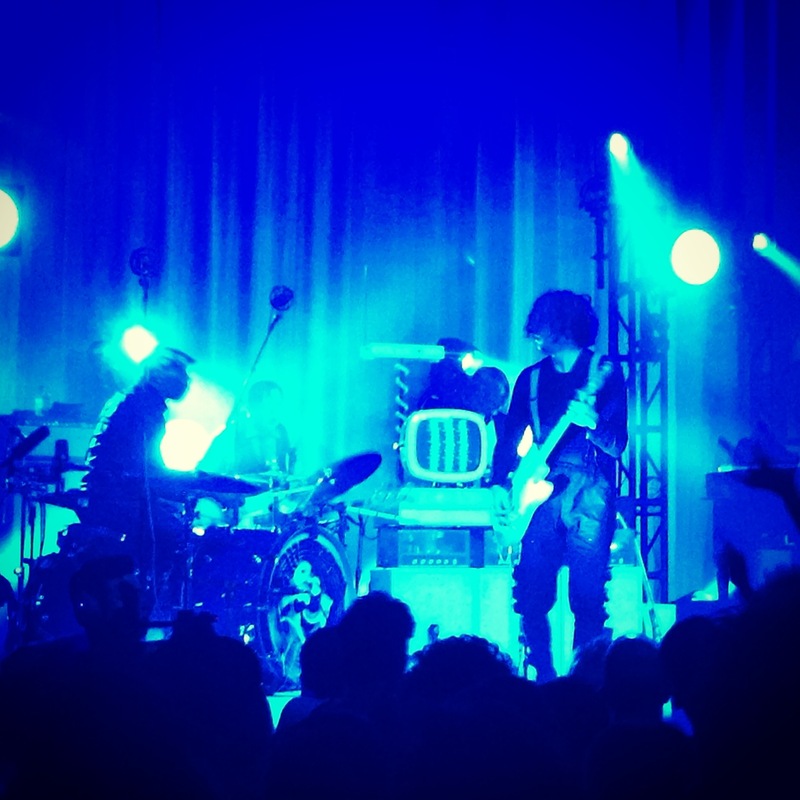 Bathed in blue- a thematic color for him in his post White Stripes red-and-white era- an organ dominated the room as the band jammed upon entry of Jack White. A slide guitar purred and an old style TV with three white lines upon it began to shake and distort into screen static seemingly with the music. Then a country-fied version of “Dead Leaves and the Dirty Ground” began. I was suddenly surrounded by tall people and no matter where I craned my head I could no longer see the main part of the action. This was further damaged by a guy who was filming the whole show on his phone, after someone had come onstage before the show began and asked the crowd to put their phones away; that there was a professional photographer who’s photos would be available for download the next day, the show was being streamed, etc. But, this wasn’t policed by security like some other bands I’ve seen, so people continued to ruin the show. I’m all for one or two photos, but seriously….STOP. After one song, it was immediately apparent to me that this would be a much ‘looser’ show than The Raconteurs or The Dead Weather. There was a lot of jammy parts, embellishments, improvisations, and pieces of music thrown around, like the beginning of “Steady As She Goes”. The band was remarkable: the beats were kept and the space was filled by a precision drummer, the bassist thumped often on a mirrored upright piece, as did the fiddler and backup singer, who’s vibe was like Taylor Swift’s evil twin. Their was a decidedly vintage feel from the slide guitarist and theramin player, and the man on keys- well, I never could see him, but good job. My first favorite song was the instrumental “High Ball Stepper” from the new record. It kind of exemplified the intersection of the old and the experimental that, to me, typifies Jack White. Onto the new record’s title track, “Lazaretto” bumps like an old school hip hop track, which fit with the vintage beats of ’80s and early ’90s rap that bridged the gap between the forgettable Cold War Kids set and this. White was “in a talkative mood tonight-please don’t mind me”. At least I could understand what he says now; previous show banter could be equated to jive talk that left me perplexed by what he was trying to say. From introducing songs to complimenting the crowd energy, each sentence incited a wave of screams. The setlist weaved back and forth between White Stripes favorites, Raconteurs hints and a track, and solo material, meaning that it also swayed from rock to country and everything in between. The ultimate highlight of the show for me was “Icky Thump” into “Love Interruption”. I’m a fan of White’s song construction, lyrics, and parts of his effects-laden guitar playing. Sometimes that almost fights his songs, though. He’s an imperfect guitarist, and the jammy, morphing of some of the songs sometimes felt like errors over extras. But just when I was lost, something completely all-consuming and awe-inspiring would swoop in and save me. “Missing Pieces” was an example of this: this demented live version seemed unglued at times, in equally good and bad ways. But at it’s core, Jack White impresses, challenges, and evolves your ideals; this is the new rock icon who has grown up in the fragmented, diverse world, who’s been affected by it, digested it, and presented it in his own unique, loud, complex and stylized manner. Into the encore, “Ball and Biscuit” featured Carla Azar, from Autolux, and also from White’s touring band from his first solo record, The Peacocks. It returned the song to Meg’s primordial drumming, which switched up the vibe for a few. Ending with “Seven Nation Army”, the show was brought around full circle, and everyone marched out of the Fonda with a taste of modern rock & roll on their tongues. Stream the show on NPR.